All the major players participating in Saturday’s “UFC on FOX: Diaz vs. Miller” extravaganza will be hitting the podium today at Beacon Theatre in New York City. Stream Thursday’s pre-fight press conference live right here on 5thRound.com starting at 2PM ET/11AM PT. Today’s festivities are free and open to the public. Doors open at 1PM local time. 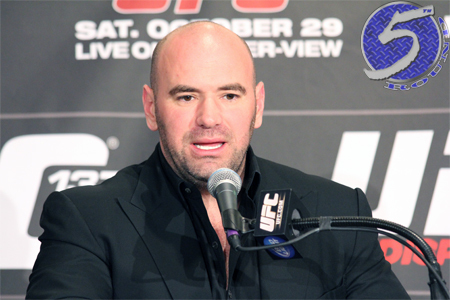 In addition to UFC president Dana White (Pictured), the card’s six featured fighters are also expected to attend the presser. Nate Diaz battles Jim Miller for a shot at the lightweight throne in Saturday night’s main attraction. Welterweight Johny Hendricks will be scrapping for the same honors when he meets Josh Koscheck in the show’s second-to-last contest. “UFC on FOX: Diaz vs. Miller” takes place inside IZOD Center in East Rutherford, New Jersey. FOX will broadcast the main bouts live beginning at 8PM ET/5PM PT.